For better or worse, Nova Scotia has recently acquired a new resident mammal - the eastern coyote (Canis latrans var.). Restricted to western North America prior to 1900, the coyote has rapidly extended its range eastward through the northeastern United States and Canada since that time. Repeating the pattern experienced in New Brunswick in the early seventies, the Nova Scotia coyote population (as indicated by harvest records) has expanded rapidly (see Figure 1) since the first confirmed specimen was taken in Guysborough County in 1977. Now established throughout the mainland and Cape Breton Island, the population and harvest are expected to continue to increase. The eastern coyote is basically a western coyote which has picked up significant wolf and dog characteristics through interbreeding. These give the eastern coyote a much larger body size, a darker, more variable and lower quality pelt, plus some wolf-like behavioural characteristics. the coyote, as a species, might apply be called a "survivor." Throughout its range the coyote has proven its great adaptability, not only colonizing but thriving in a wide range of situations. Unlike the wolf or the western coyote, our eastern "hybrid" has all the qualities needed to thrive throughout the former range of the wolf in close proximity to human habitation. The coyote is a very adaptable and opportunistic feeder, and a proficient hunter and scavenger. In addition to its staple foods, rodents and snowshoe hares, the coyote diet may also include vegetation, carrion, garbage, birds, deer and domestic livestock, as available. Potential for large litter size (2-16, average 5) and high proportion of females breeding (including yearlings) allow coyote populations to persist even under intensive exploitation and/or control efforts. The arrival of a new wild canine predator species has important implications for Nova Scotia. As a new furbearer available for harvest, the wary coyote should challenge the abilities of even the most experienced trappers. this is a mixed bless, however, as competition by this aggressive new predator for food and territories is expected to result in reductions in populations of bobcats and red foxes. This is not good news for the trapping industry as both red fox and bobcat pelts are considerably more valuable than the poor quality fur of the eastern coyote. Inevitably its predatory feeding habits put the coyote in direct conflict with human interests and activities, especially game and livestock production. Studies in other areas of North America have indicated that predation by coyotes may limit deer numbers in very localized areas but cannot limit whole populations. Nonetheless, when noticeable local predation does occur, as it has and will continue to do in Nova Scotia, it raises considerable concern among local sportsmen - concern which must be addressed by the agency responsible for wildlife management. Depredation of livestock by problem coyotes has already, and will continue, to pose serious local problems for producers of sheep and to a lesser extent other livestock in Nova Scotia. this problem is common throughout the coyote's range wherever livestock operations occur and is likely to increase as the coyote population and livestock production continue to grow. Public attitude towards the newly-acquired predator varies. 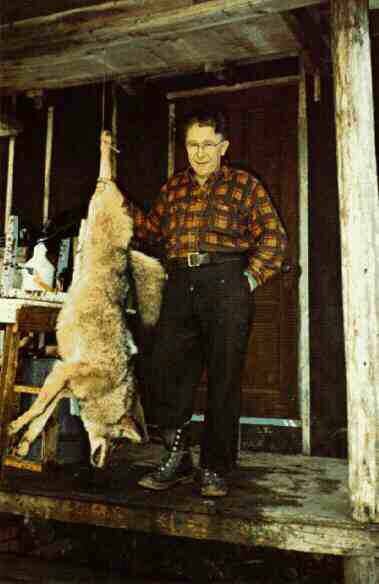 Most people know little about the coyote population. As the population is till relatively low sightings are not common. For the most part the general public is barely aware of its existence in Nova Scotia. Of those who are aware, attitudes of most would range from indifference to limited enthusiasm at the presence of a new wolf-like species filling the former niche of the timber wolf in our province. few could argue the aesthetic pleasure of a coyote howl on a still, moonlit evening. even among trappers and hunters, attitudes tend to be indifferent or positive, with the only reservation being concern for potential negative effects on other furbearer and deer populations. It is the livestock (particularly sheep)) producers and agricultural authorities who are most concerned, and justifiably so, as it is for them that the coyote presents the most obvious threat for present and future operations. Increasing occurrence of sheep-killing by coyotes as resulted in individual livestock producers and agricultural organizations calling on government to take action to control coyote populations and limit predator damage. The Lands and Forests Act currently permits an owner or his agent to destroy, by appropriate means, any animal doing or about to do damage to private property (including livestock) on land owned or leased by him. With concern mounting over coyote problems, government removed the coyote from the list of protected Nova Scotia furbearers in November, 1982. This change allows anyone to destroy or possess coyotes (pelts or carcasses) at any time of year without a permit. while the coyote may be shot at any time, it is still classed as a furbearer and as such may only be trapped or snared during the regular trapping season (November to February, inclusive), except for the protection of private property. Later, at the request of agricultural interests, a bounty of $50 per coyote was instituted (presentation of the carcass for positive identification by skull measurements is required). Past experience in Nova Scotia and elsewhere has proven this type of regulation to be ineffective in population control of predators. However, as a temporary measure, until a more effective approach can be implemented, the coyote bounty will reassure concerned livestock producers that the government is responding to their problem. In addition, the bounty should draw more public attention to this problem and may, through increased monetary incentive, stimulate competent trappers to experiment and adapt their trapping techniques and equipment to become more effective coyote trappers. Eventually, after coyotes reach stable populations in this province, trappers might be able to harvest the annual population surplus thereby reducing some of the potential problems with sheep and deer. It became obvious that Nova Scotia needed to develop a more comprehensive long-term plan to cope with the "coyote problem". Key to this effort is the need for a better understanding of the animal and the circumstances surrounding associated problems. to this end a study of the biology of colonizing coyote populations in New Brunswick and Nova Scotia was recently completed and cooperative studies are continuing to determine more about the expanding population. This work is facilitated by the mandatory submission of carcasses required to collect the bounty. Since, in other areas of North America, sheep-coyote and other coyote problems are certainly not new, we recognize that we could benefit greatly from the advice and technical expertise of individuals competent in dealing with coyote problems. In February, 1983, two professional animal damage control specialists were recruited from the U.S. Fish and Wildlife Service. They presented a series of seminars for government officials, agricultural interests and trappers with the aim of creating a better understanding of coyotes and coyote problems. The seminars and subsequent discussion of the problem among interested groups proved most productive and will provide a basis for developing a practical, realistic approach to the problem. Coyotes and associated potential problems are here to stay. Predator damage control (as opposed to the large-scale population control) is the only viable option for coping with problem coyotes in this province. If the extent of the problem becomes such that there is sufficient damage to warrant it, predator control will be most effectively accomplished by a full-time predator control officer with the necessary skills and equipment and time to devote to the problem. Information and education will be an important aspect of a continuing response to coyote problems. Further seminars and distribution of printed education materials for government agency personnel, livestock interests and trappers will facilitate better understanding and ability to cope with the problem. Livestock producers can be guided in helping themselves. Operations may be modified (where possible) to minimize damage and/or increase protection. Better fencing (including electric), repellents and other techniques may be useful in various situations. The ability of trappers to capture coyotes can be improved. government agencies can play an important role in facilitating cooperation between trappers and landowners to provide assistance with coyote problems. No one tool or approach is the "super solution" to the problem. A multi-method approach, responding to specific situations and supplemented by information and education programs, will be the most effective course of action. IMAGE: This 40 pound male coyote was taken by Lloyd Duncanson in Cumberland County.